Hennadiy Korban, the leader of the Ukrainian party Ukrop, has undergone surgery at the Amosov Cardiovascular Surgery Institute in Kyiv and is currently in intensive care, party press secretary Yevhenia Kravchuk said. "Based on coronary angiography results, doctors from the Amosov institute insisted on immediate surgery, double stenting, as there was a heart attack risk. The operation passed successfully. Korban has been transferred from the surgery unit to intensive care and remains in the hospital," Kravchuk said on Facebook on Friday evening. Korban, a former deputy head of the Dnipropetrovsk regional administration, who had run recently for Kyiv mayor, had been detained in a sweeping special operation aimed at liquidating a criminal ring on October 31. He was later placed under house arrest. Kyiv's Dniprovsky District Court is expected to continue a hearing on changing a pretrial restrictive measure for Korban, whose house arrest expires on December 31, 2015. 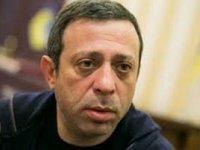 It was reported earlier that Korban had been brought to Kyiv to be subjected to a forensic medical examination. Kravchuk said later that Korban's health dramatically worsened, which prompted doctors from the Amosov Institute to demand his hospitalization.